This premise, however, allows for a wide range of styles and approaches to this very broad concept. There have been at least thousands of stories that utilize some aspect of time travel, therefore it would be a daunting task for any anthologist to select a set number of time travel stories and publish them. Editors Ann and Jeff VanderMeer in The Time Traveler's Almanac have tackled this issue with a sound approach: select a range of stories, conceding that several reader favorites will have to be left out due to size or duplicate theme issues, and group them into four broad themes: Experiments, Reactionaries and Revolutionaries, Mazes and Traps, and Communiqués. This thematic division allows for some interesting pairings. By having a section devoted to Experiments, for example, it is much easier to compare and contrast various approaches to the issue of Time as a scientific endeavor. What manipulations can be effected if X is done in time Y? The various ways authors such as Richard Matheson, Ursula Le Guin, Michael Moorcock, and Douglas Adams, just to name a few of the authors appearing in this section, approach the idea of time travel as a scientific experiment creates a sense of iterations unfolding before us, leading to a larger appreciation of time travel as a series of variations on our own imagined and understood pasts and presents. Readers who favor a more "political" approach to time travel, particularly in how it comes close to alt-history, will find several stories in the Reactionaries and Revolutionaries section appealing. The Ray Bradbury story that I quoted above, which birthed "the butterfly effect" term for how seemingly trivial effects in the past can affect the future, is perhaps the best-known of the stories included here, but there are several others that caught my attention. And so it goes for the remaining sections. The VanderMeers' grouping by theme allows readers to pick and choose which stories that interest them most. While it is nigh impossible to treat within the confines of a ~1000 word review each individual story at length, what I can note is that as I read these stories over a period of weeks, the stories within the four sections began to feel more like a series of overheard conversations about what time travel would/should mean. Although there is some blurring of stories (as I glance at the table of contents, several titles fail to elicit more than a vague recollection of their contents) due to there being over sixty stories and authors selected read from April-June, I do not recall there being any story that I felt definitely should not have been included in the collection. As for stories that otherwise could have been included, perhaps there will some time machine in the future invented that will rectify this, creating multiple iterations of The Time Traveler's Almanac for those who loved all but X and wanted Y to replace it. 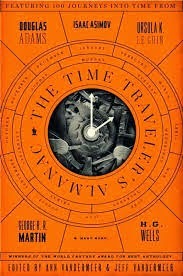 As for myself, The Time Traveler's Almanac works as a very good sampler of the wide range of time travel stories published in English over the past 120 years.